The décor is uber cool. 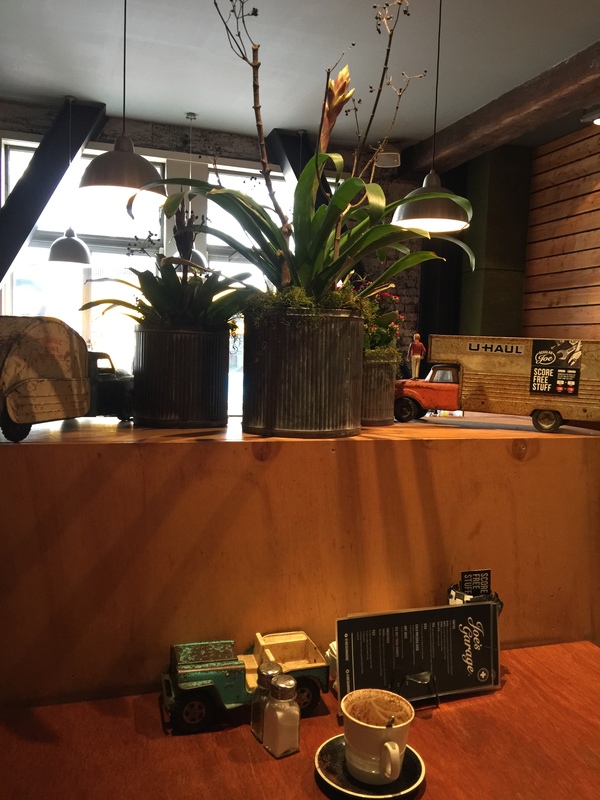 You need to cast your eyes around and check out their art and cute knickknacks which are themed around cars, trucks, garages etc. The booth seating was all full darn it but we didn’t mind sitting on the stools as the longest shared table in Wellington. 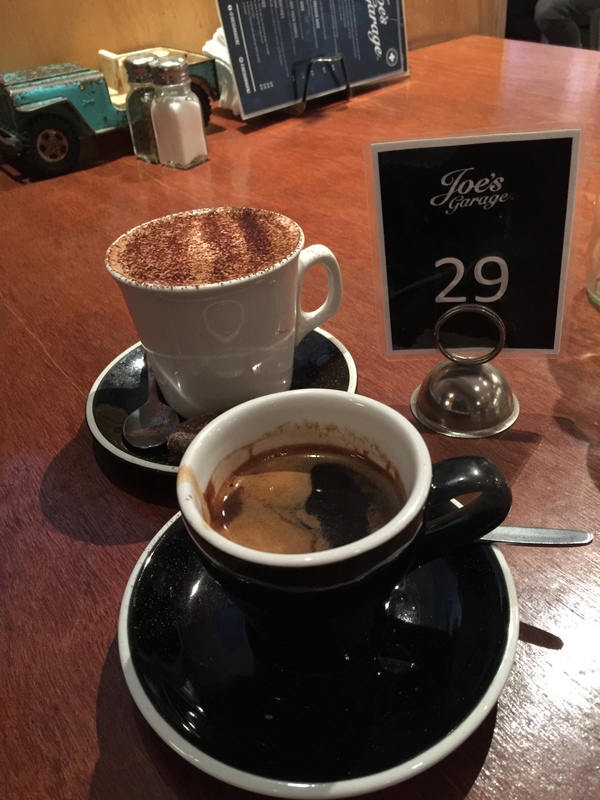 I recognised the barista Gavin who is now Duty Manager at Joe’s (previously worked at Mojo). He remembered my name and I haven’t seen him for a good 3.5 years, so that’s the sign of a good barista. He makes a darn fine coffee still and they use Ozone which is delicious. I started with a long black and hubby had a mochaccino. 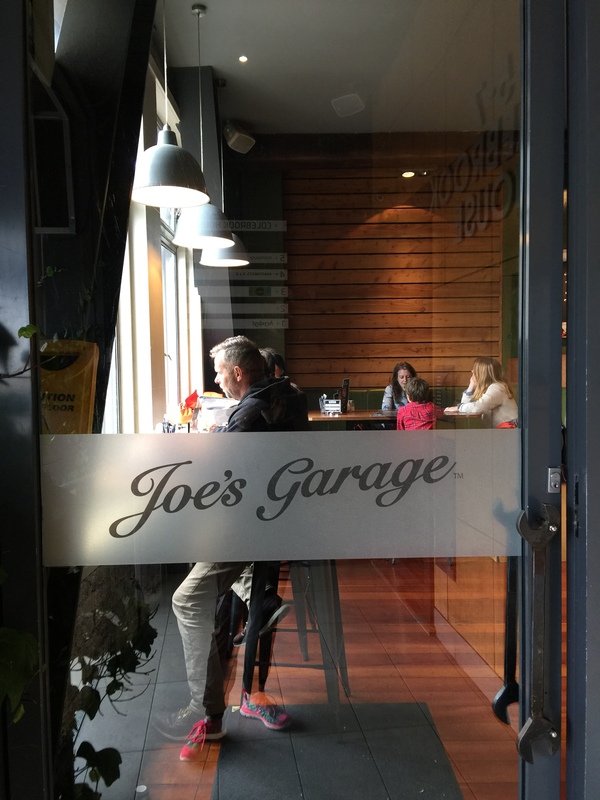 You can buy a Joe’s keepcup too if you want and try a black doris plum, salted caramel or chocolate brownie from the cabinet to go with it. 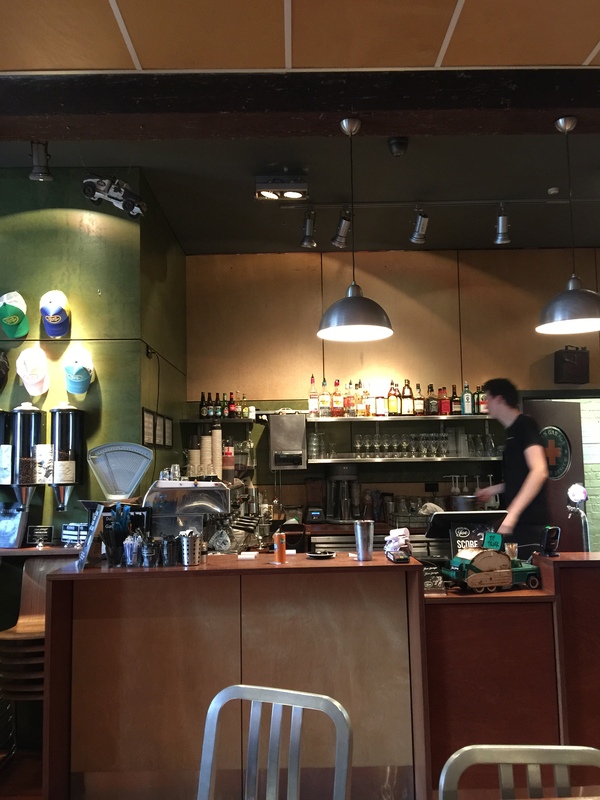 They serve an iced coffee, tea, shakes, smoothies, hot or cold juices and fizzy. Their menu is available until 5pm. You can just order from a selection of hot rolls e.g. a bacon or bratwurst or opt for muesli, porridge, fruit crumble, pikelets, burrito, eggs dishes, burgers and salads with a great choice of side dishes. I told hubby he was going to have the schnitzel. No argument there as I know him so well. However his poor wee face dropped when we were told the Autobahn (translates to highway in German), was off road, off limits, as in not available, due to its popularity? Really? Right on noon? I’m not sure if that was quite the case. 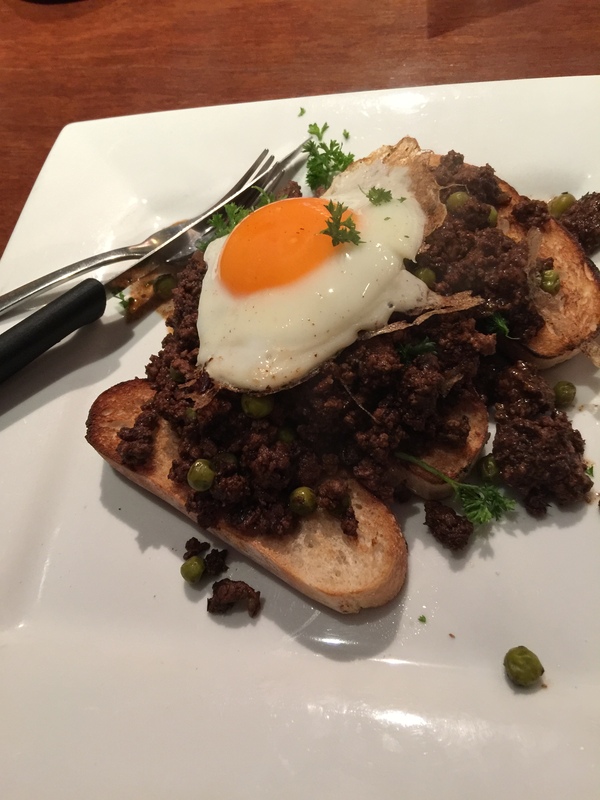 Anyway I recommended the Clever Trevor – mince on toast with poached egg instead. He really enjoyed it and commended its portion size. I’ve eaten this here before. I remembered it as being really good, but that was before I mastered my own at home. 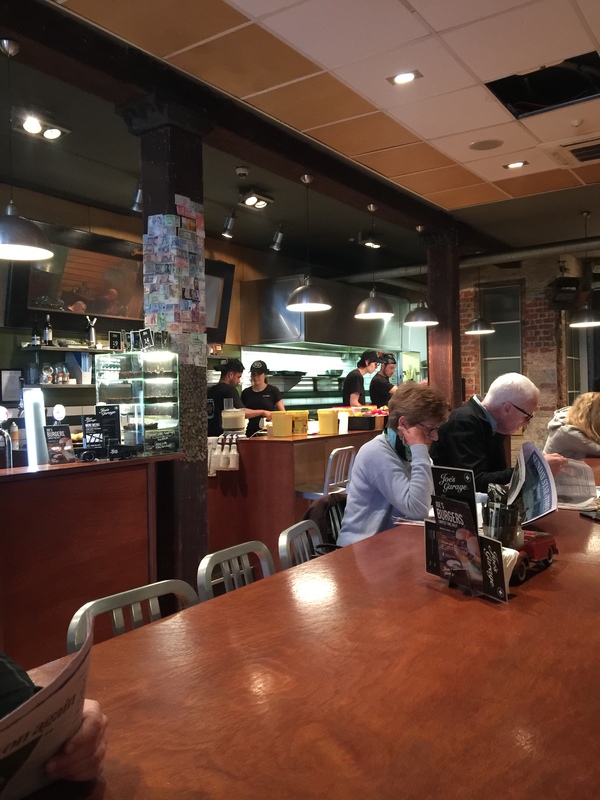 I actually think mine is the best in town by a country mile, although Caffe L’affare’s sits hot on my heels. This one here was just a little too dry for my liking. 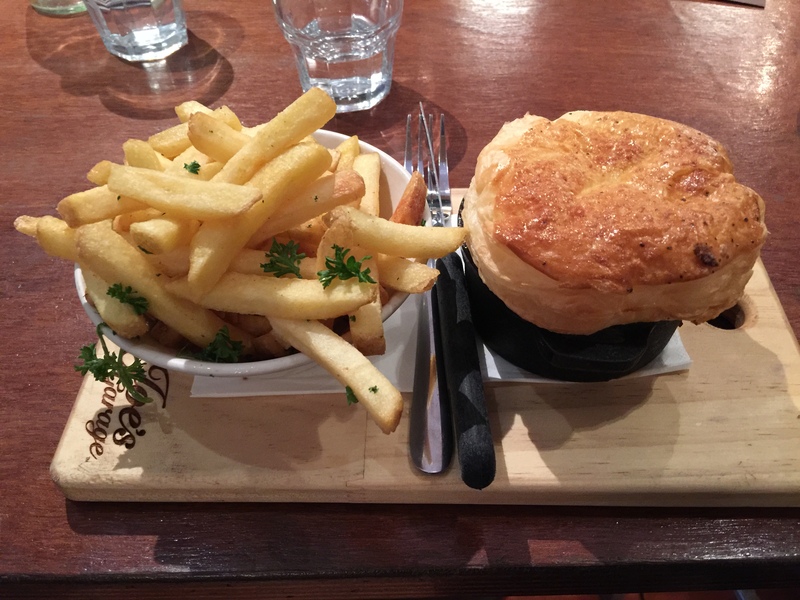 I was keen for a Cheeky Joe; slow braised beef cheek hotpot topped with a removable pastry lid and fries. I nearly switched, as I wanted to try the special breakfast burger. The pulled pork was calling out to me. 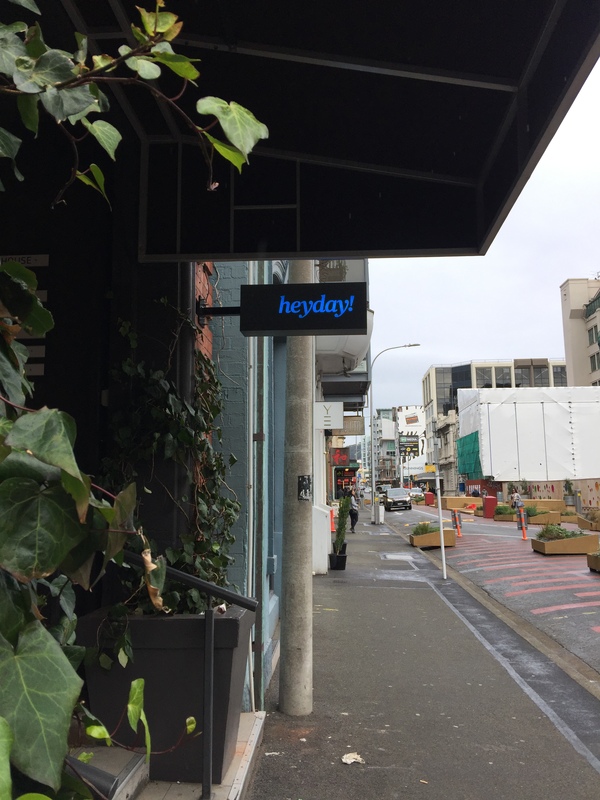 Our friendly waitress helped me stay true to my first choice and I was so pleased I did. It was so melt in your mouth tender, and slightly sweet. It was served in a tiny wee Spanish dish and came with a good portion of fries for $19. Hubby doesn’t like sharing, but it’s ok for him to hoe into my chips isn’t it without asking? And do I say anything? Of course not. 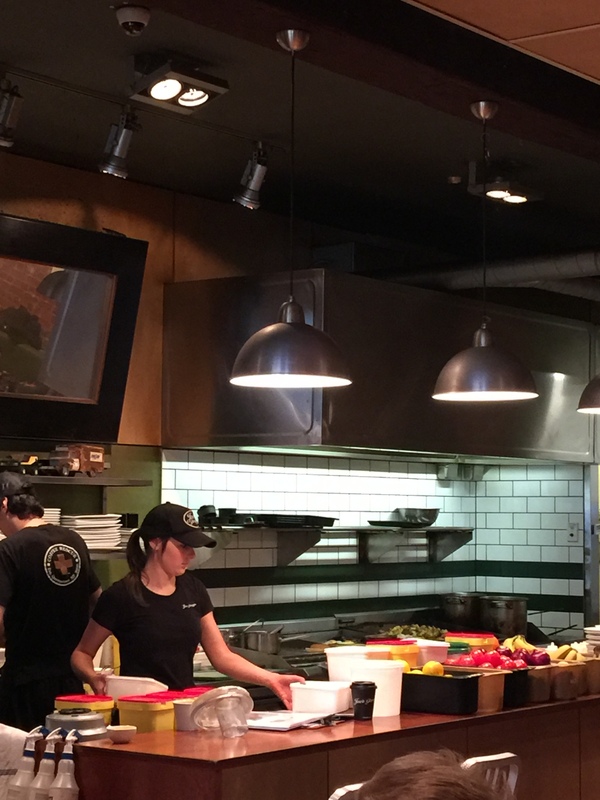 I’d love to come back again as there are a few other dishes I’d like to try. 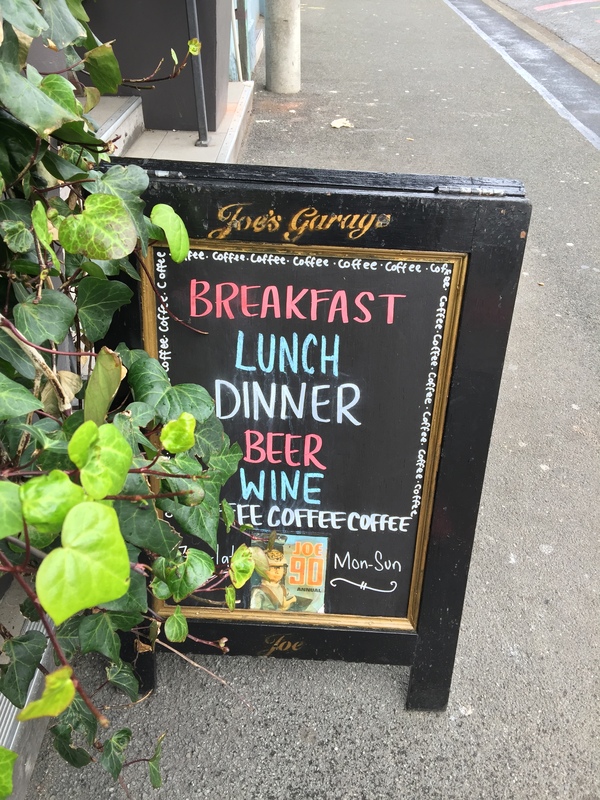 Breakfast is my favourite meal but I’d be keen to try a casual dinner and test a long island iced tea or espresso martini. They have a fully stocked bar with all types of hard liquor, wines and craft beer too.